While I’m not super excited about how commercialized our holidays have become I do get stoked on seeing big discounts on gear that I own and love. I subscribe to quite a few gear companies emails and I’m combing them all for the best upcoming sales on specific items I have either reviewed or would love to own. I will also be specific on what the actual discount offered is! None of the “up to x percent off”… I hope you find this list more personal than your average marketing email, and if you have any questions about any of my suggested products please let me know in the comments! 30% off Arc’teryx ACRUX AR Mountaineering Boots! (use code ARC30 at checkout) My current favorite ice climbing boot with a very detailed review here! 25% off LaSportiva Boulder X Approach Shoes– I reviewed these this Fall here! 25% off Scarpa Phantom Tech Mountaineering Boot– Lighter version I hope to review! 25% off Petzl GriGri+– This is the lowest price I’ve seen on this awesome device I reviewed here. 25% off Petzl Sitta Harness– This is my go-to harness and I reviewed it here. 25% off Petzl Sirocco Helmet– My favorite helmet of all time (thus far!) Review here. 25% off Petzl Nomic Ice Tools– Save $150 on a set of these! 33% off the new Black Diamond ATC Pilot Belay Device– I want one. 25% off Black Diamond HiLight Tent– I used this for two weeks in the Cascades this summer and it was perfect! 45% off Women’s Black Diamond First Light Hoody– I reviewed this great piece here! 30% off Men’s Black Diamond First Light Hoody– Bummer not same deal as women’s! 25% off Black Diamond Express Ice Screws– A standard in the category! I will add more from Backcountry as I find deals but these are my current “top picks”. If you missed my “20 Holiday Gifts for the Mountain Lover” you can check it out here! Affiliate links support this blog at no additional cost to you! Chances are if you are reading this you have a climber, skier, hiker, mountain biker, or trail runner in your life. You’ve probably already started to see “holiday guides” come from various retailers and bloggers. Here I present my personal hand selected gift ideas for the adventurous mountain traveler in your life. Some are locally hand-crafted ideas from friends and others are time tested national brands so please take a look! Another socially and environmentally conscious company Life Straw makes getting safe drinking water possible with innovation and effective products. I have been using the Life Straw Steel model over the last couple months and it’s becoming a standard part of my day kit. This device allows someone to summon help even when they are far away from cell phone service. It provides piece of mind to my wife when I’m out on a week long trip in the mountains by allowing me to send “check-in” messages that show her where in the world I am. This is an excellent gift for the adventurer in your life! I’ve had the VSSL Supplies model for two years now and it’s an integral part of our home emergency kit (extended power-outs) and comes with us on road trips as part of our “on the go” kit. While it’s a little heavy for me to take climbing I know a few hunters that have added it to their day kit and it has a lot to offer the casual back-packer and car-camper. See my detailed review I posted here! My friend Brittni started this hand-crafted company just last year and I’ve been seeing her work at local coffee shops and at the crags! The iconic “drink sweater” is right at home keeping that pre-climb coffee warm or that post-climb beer cold! I’m definitely excited to be giving something handmade to some of my loved ones this season! This charger sees almost daily use as I use my iPhone extensively while out climbing and for most of my video editing. What I like most about this charger is that I can get at least 3 full charges from it and it charges much faster than a wall outlet. You can pick this stocking stuffer up on Amazon here. This goes with me everywhere. It’s super comfy on airplanes as a blanket and in hostels around the world. I also like that it keeps my expensive down sleeping bag clean (extending its life) even after weeks of grimy sleeping! Simple lightweight option to make meal time easy! If ropes are involved these come with me. They were perfect for the warmer daytime glacier temps and offer great protection for rappelling, short-roping, etc. I customize mine a little but this is a great base kit at the price! Super affordable and weighs less than 4 ounces means there is never a reason not to bring this! I recently upgraded from my older Petzl Myo model and this new model is awesome! Up to 260 hours of burn time and able to through light 90 meters! If you’re due for a headlamp upgrade I highly suggest you check out this model! Fire-starter is on every gear list, and this one is a good value! A great little HD cam with advanced features beyond this post. You can see some of the footage about a minute into my Forbidden Peak video! My current favorite GPS navigation capable smart-watch with optical heart-rate! This is the watch I used to create the GPS tracks linked in the trip report. It also allows one-button waypoint saving and the built in barometer/altimeter was a nice plus to our navigation plans. I would like to upgrade to the new Fenix 5 soon! My personal favorite avalanche beacon with a host of advantages over other beacons on the market. Super fast processor and “Smart Antennae” technology helps you find and be found faster. On sale on Backcountry.com now! These high end goggles out perform every other brand I have ever tried. As a brand ambassador I can share my promo code “ALPINESTARTF&F” which will get you 20% off when ordering directly from www.revo.com! Perhaps your loved one has been talking about taking an ice climbing course or avalanche safety course for a couple of years now but hasn’t pulled the trigger? Give them the nudge they need with a gift certificate for a course at Northeast Mountaineering! Also be sure to use promo code “DavidNEM” when you book a course for a chance to win a free guided adventure of your choice! UPDATE: A couple readers pointed out an excellent gift idea is a membership to an organization dedicated to access, education, and conservation. To that end I’m embarrassed I didn’t think of that without the nudge so may I also include a membership to the Access Fund and/or the American Alpine Club, two organizations I have supported through membership for over the last 15 years! While I do love these online deals I want to take up this space by encouraging you support local businesses, especially small specialty climbing shops, with your business! To that end if you can physically visit this stores please do! Well that’s my list! I guess it was 25 items. I hope this helps you shop for your loved ones this holiday season! Those who know me know I can be a little obsessive about gear. I enjoy making detailed gear lists for trips sometimes weighing everything down to the ounce. I shared my first gear list for ski touring in Iceland this past April and most recently in a trip report for climbing Mount Shuksan in the Cascades. Since I have two more trip reports for the Cascades coming soon I’ve decided to give the gear list its own post that can be easily linked too without taking up so much space in the trip report. Having over 20 years in outdoor retail I love chatting about gear so if you have any questions about any of my recommendations, or suggestions for better products, please comment below! At just over 2 pounds this pack has enough space for 3-4 day alpine endeavor’s, rides comfortably, and is made of materials that will last for over a decade of adventure! Also made in Maine! A super lightweight and pack-able 2 person single wall tent. I spent 12 nights in this from car camping between climbs to dug in at 11,000 feet at Ingraham Flats on Rainier and the tent performed perfectly through-out! This was the best gear purchase I’ve made in over a decade. I have a few sleeping bags from a great heritage -30 EMS down bag to a fairly light 35 degree synthetic sleeping bag but I decided to upgrade for this trip and I could not have been happier for my first Western Mountaineering sleeping bag! I’ll go into greater detail in a review later but for now I’ll just say I slept GREAT in this compressible lightweight sleeping bag! This goes with me everywhere. It’s super comfy on airplanes as a blanket and in hostels around the world. I also like that it keeps my expensive down sleeping bag clean (extending its life) even after weeks of griming sleeping! I upgraded from my older, heavier, bulkier Therm-a-Rest Prolite sleeping pad with this in “short” and doubled it up with the closed cell foam pad listed below. It was a great combo for both warmth and comfort! Affordable added warmth and comfort, I used a full length model to pair with the short model mentioned above for a very comfortable and adaptable combo. This stove was amazing on this trip! Super fast and efficient for melting snow I could easily budget just 2 ounces of fuel per person per day assuming we had water sources at Lake Ann and below Winnie’s Slide bivy site. For dinner and breakfast I went with Mountain House meals. The egg scrambles were one of my favorite. For a dinner appetizer I carried a Lipton noodle soup packet and combined it with a Miso soup packet, great for replacing lost sodium and electrolytes! The Mountain House Pad Thai and Chicken Fajita Bowl both tasted great! My mountaineering boots of choice, full review of them here. While I LOVE these boots for my cold New England ice climbing and mountaineering adventures they turned out to be a little too warm for Shuksan and Forbidden (but perfect for Rainier, more on that later). My co-guide Jordan who has been having a banner season in the Cascades was rocking the Salomon S-Lab X Alpine Carbon 2 GTX Boots… these things look AWESOME! Basically comfy enough for long warmish approaches, crampon compatible, and climb rock really well… I will be getting a pair of these before my next summer Cascade adventure! Make sure you select the Leverlock or FL option! Great all around mountaineering crampon in my book! I have led grade 5 ice in them and walked hundreds of miles in them from Washington to Katahdin over the last decade and they are still going strong! I do plan to shave a little weight for these longer glaciated non-water ice routes by picking up a pair of Petzl Leopard Crampons soon! The lightest most compatible trekking poles I have ever seen! I’ve been loving these! I’ve used them all over the White Mountains including a 2 hour car-to-car ascent of the Northeast Ridge of the Pinnacle! You can see them during one attempt in this video. This has been my mountaineering axe for almost 15 years and is the right balance of weight and durability. Finally got the latest version of this iconic helmet and went into a ton of detail in a long form review last month here! I brought this harness for the more technical climbing on Shuksan and Forbidden and my full review of it is here. I brought this harness for the less technical Disappointment Cleaver route on Mount Rainier. Super lightweight, pack-able, and able to put on while wearing skis. It is everything I want in a mountaineering harness. Detailed review coming soon. A solid choice for glacier and ski mountaineering trips. Two per rope team is ideal! I also pre-rigged this with a double length Dyneema sling and Petzl Ange S carabiner. My favorite and trusted compass/clinometer for the last two decades! A staple of every outdoor adventure, I carry two of these for my hydration needs! Cell phone service is very spotty on Mount Shuksan. I was able to find a bar or two of service (Verizon) at Lake Ann (southwest side) and send and receive a few text messages. We had no service at the bivy site at the top of Fisher Chimney’s however I was able to FaceTime my wife from the summit! For the times with no service the SPOT GPS Messenger easily allowed me to send “check-in” messages home and in my opinion is an important piece of rescue gear should an incident occur. I always carry a spare headlamp on multi-day adventures and this is my choice back-up model. It’s small enough to fit in my first aid kit but still bright enough to function as a real headlamp. My current favorite GPS navigation capable smart-watch with optical heart-rate! This is the watch I used to create the GPS tracks linked in the trip report. It also allows one-button waypoint saving and the built in barometer/altimeter was a nice plus to our navigation plans. This thing was great! About the size of a deck of cards it packs 10,000mAh which easily provided 4 full re-charges for my iPhone 6s and still have 50% juice left! I absolutely love this piece and went into great detail about it in an in-depth review here. I’ve been wearing these back east for most of my Spring/Summer climbing season with multiple trips in Huntington Ravine and through-out the White Mountains so I felt confident taking them as my main climbing pant to the Cascades. Having essentially lived in them for two weeks of non-stop climbing I can whole heartedly endorse the comfort and performance of these soft-shell pants! This is in my opinion the most critical piece of glacier clothing you can own. I reviewed it in detail here but on a shade-less blazing glacier this one garment offers more protection and comfort than any other article of clothing I own. I’ve said it before and I will keep saying it… EVERY climber should own one of these! I do have a small cult following of “sunshade hoodies” who have “seen the light” or better yet “appreciate the shade” that these things bring… just get one and thank me later ok? Thanks for reading! Got a question or comment? Please comment below and stay tuned for next week’s trip report of The West Ridge of Forbidden Peak! How much thought should one put into their choice of gloves for mountain adventures? If you are a hiker, climber, or skier, you probably spend a fair amount of time thinking about your glove choice. After all, our clothing is really “gear” that needs to perform well by keeping us warm and dry in a variety of adverse conditions under different levels of exertion. To that end most mountaineers head into the hills with 2 or 3 pairs of gloves meant to adapt to the situation. A common system, and one I’ve used for over a decade, is a 3 pair system. A medium weight type glove for colder ascents. Still super breathable so a great choice for super cold but high exertion type climbing before you get above treeline. Coincidentally these Outdoor Research Alibi II gloves also rock at harder technical ice climbing. A “full on” glove. Ski glove. Mountaineer’s glove. Warm, and waterproof, but a bit bulky (read less-dexterous), but able to keep our very important digits from going numb in the coldest conditions. This where the newly released Give’r Four Season Gloves come in. First, what does “Give’r” mean? From the Giver’r website it means “To give it your all, go for it”. This grassroots company started in Wyoming in 2011 first with hats then launched it’s website in March 2012 with a line of adventurous quality “lifestyle” clothing. Still insulated with an all leather exterior, they’ve added some beefiness, a leather skirt, elastic cuff, improved the design to be form fitting, and reinforced areas for durability. The biggest addition is the waterproof membrane which makes the 4-Season Gloves 100% waterproof and windproof without needing any maintenance (unlike Kincos). As an avalanche course leader I spend quite a bit of time poking my hands into cold snow. While this winter may have seemed mild we did hit a record breaking -40f and I spent quite a few days above treeline in “crazy cold” conditions. 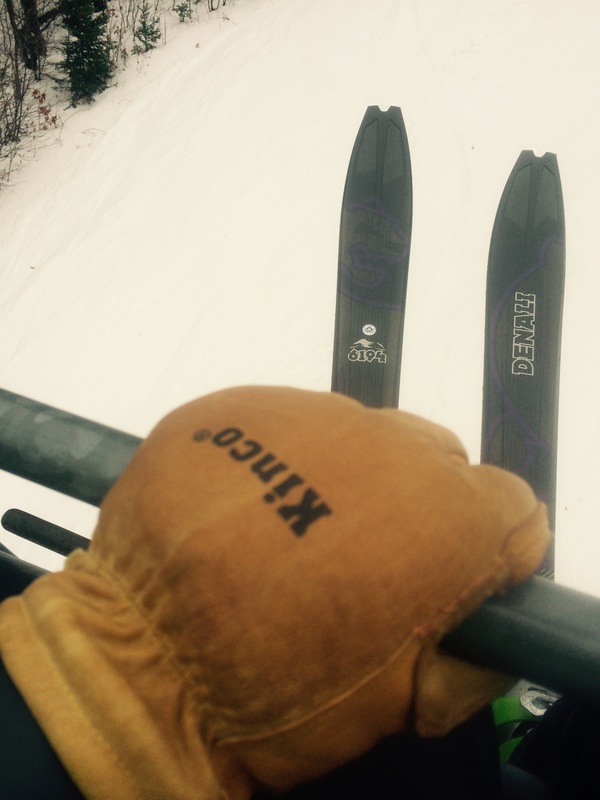 The Give’r Four Season Gloves easily matched the warmth of my trusted Kinco Ski Gloves. So what sets them apart from Kincos? First, I’d say the fit. After a couple of days break-in these felt comfortable enough to lead moderate ice climbs (Grade 3 or lower in my opinion). I’d certainly opt for my more form fitting Outdoor Research Alibi 2’s for any grade 4 or harder, but for cold weather Grade 3 these worked great*! I even grabbed a bit of GoPro footage and dusted off the old iMovie skills for a quick clip of them in action. Please excuse my mention that Give’r was out of Utah. Give’r is a Wyoming based company! Obviously these gloves have a place in your quiver of gloves since most winter enthusiasts enjoy 4+ of the above activities. There’s a couple of other things that set this company’s gloves apart from anything you’ve probably ever purchased. 1. Customization. The Give’r Classic Gloves offer free** initial engraving on each pair. This is pretty cool as there is no way your climbing partner or significant other is going to try to booty your gloves when they’ve basically been branded. 3-initials is the limit, so I can think of a few acronyms I might opt for rather than my own initials. 2. Hand applied wax coating. The company offers this personal service for hand treating the leather with SnoSeal to double the waterproofness and help preserve the leather. Personally, I enjoy this step to much to have someone else do it. It’s therapeutic. But maybe you are busy and want someone to treat them for you? $10 gets the job done! Finally another big difference between this and similar style gloves is the use of a 100% waterproof Hipora lining. There are some advantages and disadvantages to this construction. Drying time. The combination of liner + leather exterior really limits feasible breath-ability. If moisture gets in the glove from either perspiration or bad habits (don’t drop your gloves in the snow while putting your crampons on) it will be hard for it to exit. I noticed after two hours on my electric boot/glove dryer I still had moisture in the finger tips after a long field day. Reaching out to the manufacturer I confirmed this is an issue, and the seal around the wrist that is so good at keeping snow and cold out of the glove is equally good at not letting the warm electric dryer air let that vapor out when trying to “hyper” dry. The best option? Don’t use an electric dryer, prop them open with an empty paper towel tube, and sit them upright on my baseboard heaters. This solution allowed them to dry fully overnight after a rather damp day on the hill. The key here is airflow in & out of the glove. Greater warmth and bombproof water-proofness! With the Hipora lining & treated leather you’ve got essentially a vapor barrier type system. High altitude climbers know the benefits (and disadvantages) of using vapor barrier socks, pants, shirts, etc. There is no question that these gloves, while similar in appearance to my Kinco Ski Gloves, are indeed warmer given this property. This advantage diminishes with multi-day trips away from drying sources, but for day outings in arctic cold these are the bomb. A new comer to the true 4 season glove market I think this company is got a hit with this new model. I’m anxious to try their Classic model which is available to purchase directly from their website here. The 4 Season Model is currently in the Kickstarter phase and early supporters are able to secure some of the first shipments in June 2016 for $69/pair, 30% off the retail price of $99 by pledging here. There are a limited number of pre-orders available (as of the date and time of this post 444/735) so if you want to get in on a pair now is a great time! Disclaimer: While the pair I tested was provided at no charge it was only a loaner and has been returned to the manufacturer. To that end I could not comment much on durability though the manufacturer has provided quite a bit of info regarding how well these hold up, and personal inspection indicates they would probably out live my Kinco Ski Gloves (901 model) which are showing some seam failure on the end of their 2nd full winter season (keep in mind that’s still a lot of field days!). All this aside, these opinions are my own and I’m happy to pinky swear. Coming up: Avalanche course season is drawing to a close. For those participants waiting on photos/write ups I’ll be combing the Level 1 two weeks ago and the 2 Level 2’s ending this week all in one season recap later this week. Thanks for reading! In 20 years of climbing I have only recently started carrying belay gloves with me on a regular basis. When I first started climbing it seemed like an unnecessary extra item. My hands could handle a little rope burn from time to time right? After joining the local Mountain Rescue Service I started carrying them on rescues due to heavier loads and lots of rope work (and some BSI protection). In the last two years I have switched to carrying them 100% of the time, and now feel like I am missing something if I leave them at home. Perhaps it is because I am climbing & rappelling on skinnier ropes than I was 15 years ago, but the added security and comfort they provide easily justifies their cost & weight on the back of my harness. For this review I tested both the mid-weight and lightweight versions of these gloves. When I first tried on the mid-weight Petzl Cordex Belay Gloves in the store they felt a bit stiff. The double goat leather palm and fingers definitely looked durable but I could tell they would take a little breaking in. In just about 5 days of use they softened up nicely. For a rugged belay glove they fit my medium sized hands quite well, and the neoprene velcro cuff made them feel secure when in use. The convenient carabiner hole in the cuff is also substantial enough that there is no fear of of the carabiner attachment failing (unlike some models that just sport a thin sewn loop). I carry these on an oval biner’ that sports two prussic’s, a micro-ascender (Petzl Tibloc), and my knife. They feel just as durable in the palm and fingers as the midweight version but the back is almost 100% breathable stretch nylon. These will be much more comfortable climbing in warm weather and will definitely outlast the cheaper suede style belay gloves some of my fellow guides use. If you haven’t used belay gloves before I’d suggest you try it out. They make a lot of sense for multiple styles of climbing. Catching sport climbing falls will feel more secure. Rappelling skinny rope in steep terrain will feel more secure. Even quickly coiling rope to move on to the next route is easier when the rope can quickly slide through your palms without nylon on skin friction. You can find them on Amazon here. 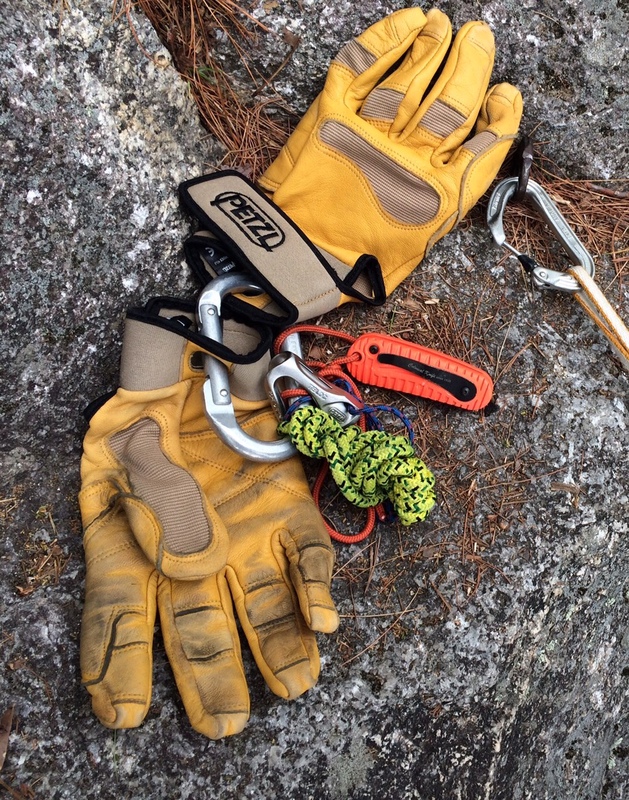 If you have an opinion on using belay gloves please share it below! Let us know what model’s you’ve tried and liked (or not liked) in the comments below. Disclosure: I purchased these gloves with my own money. This post contains affiliate links. High Performance Sticky Technical Perfection! A couple months ago I mentioned I would be reviewing these after I reviewed Kincos gloves as an affordable alternative to high end climbing gloves. While Kincos are great for general mountaineering and back-country skiing sometimes the cost of fancy specified gloves are worth it. The Outdoor Research Alibi II Gloves are a perfect case in point. 1) Warmth. While still an un-insulated “thin” glove with excellent dexterity the Alibi II is a bit warmer than the BD Torques. I still opt to wear my EMS Glove Liners with either glove, as this dirt cheap glove liner adds a bit of warmth and comfort to either of these gloves and makes them both feel a bit more comfortable against skin, especially when using the Alibi’s as the inside of the Alibi can get a bit clammy during a day of climbing. 2) Grippy-ness. The Alibi II uses quite a bit of “Pittards® Oiltac Leather Palm for Enhanced Grip and Optimum Control in Wet or Dry Conditions”. This material is simply the stickiest material I have ever found in a climbing glove. It almost feels un-natural how “tacky” this proprietary leather is. My climbing partner today showed disbelief that this leather was not actually a synthetic rubber compound. You really need to feel it in hand to realize the reality of how sticky the material is. 3) Durability. 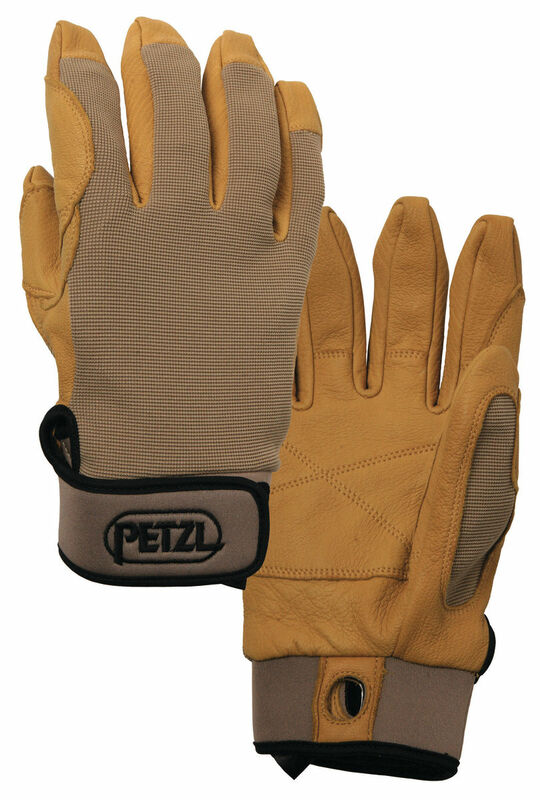 This same unique leather boasts a lot of durability over the non-slip synthetic materials used in similar gloves. After trashing multiple pairs of BD Torques while rappelling & belaying over the years I think I’ve found a thin pair of technical gloves that I do not always have to swap out with my more durable Kincos for every single rappel. To be honest a couple full rappels on the BD Torques could show visual signs of wear in the palm. 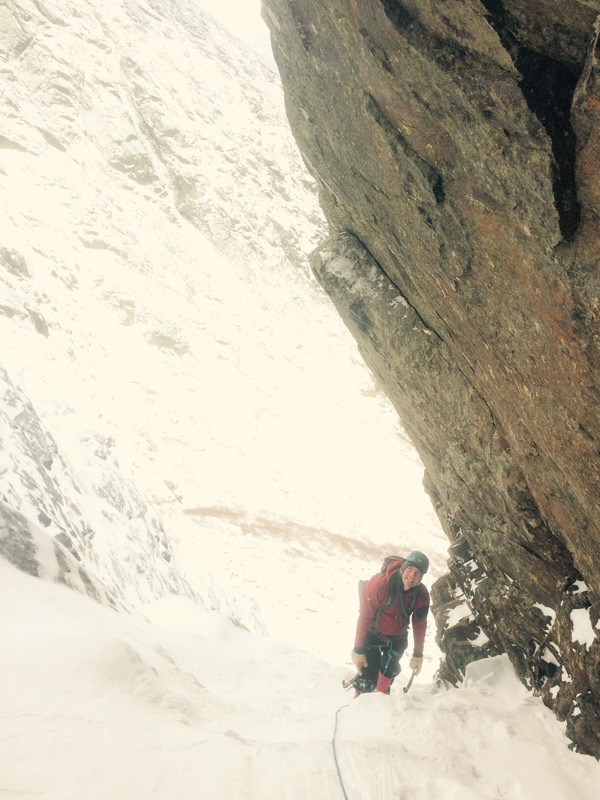 Today a hasty full length rappel from a Cathedral Ledge ice climb showed no noticeable wear on the palm. While I can burn through a pair of BD Torques in a full season from what I have seen so far I may be able to get 2-3 full seasons out of the Alibi II’s. 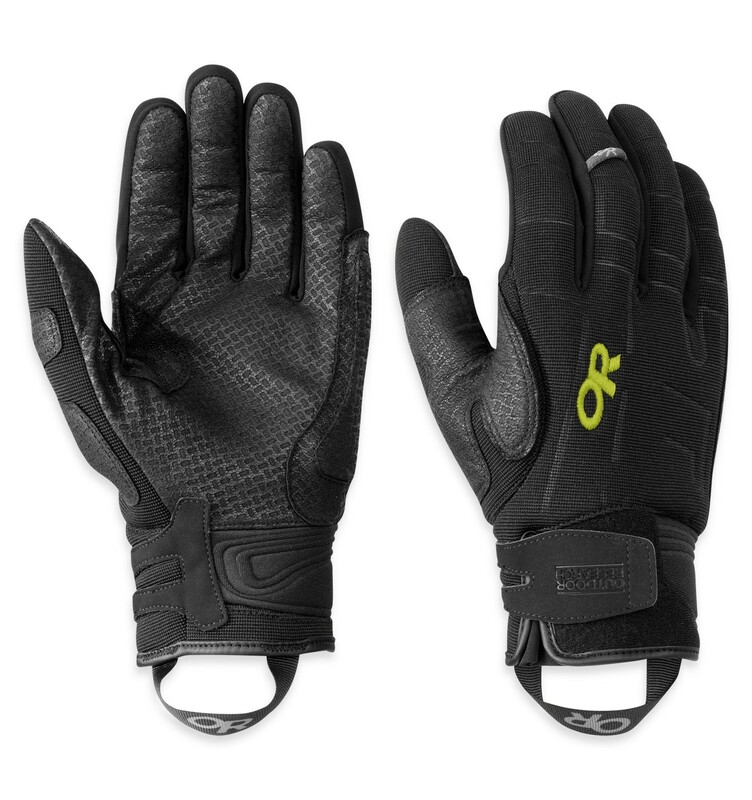 Two other small convenience features add value to these ultra-light technical gloves. First, the “carabiner loops” on the middle finger that let you clip them quickly to a Petzl Cari-tool or carabiner while you fiddle with something requiring glove liner, or bare hand, dexterity. Second the re-enforced pull loops at the cuff that help you pull the snug fitting glove in place. No need to bite the cuff while trying to slip these on! In summary, these should be on your radar if you are leading Grade 3+ and above ice. 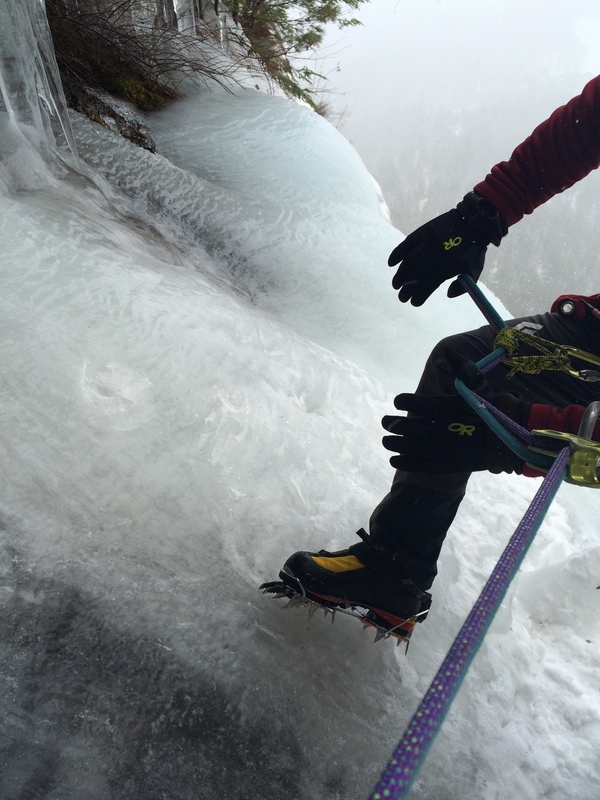 Having excellent dexterity while placing & clipping ice screws is a huge boon when leading. I’ll still fall back on my insulated BD Ice Gloves for leading in really cold conditions, but for the fast majority of ice climbing days you’ll find me happily swinging away in my new Outdoor Research Alibi II Gloves which you can purchase here. Disclaimer: I purchased these gloves with my own money. This post contains affiliate links that help support this site. 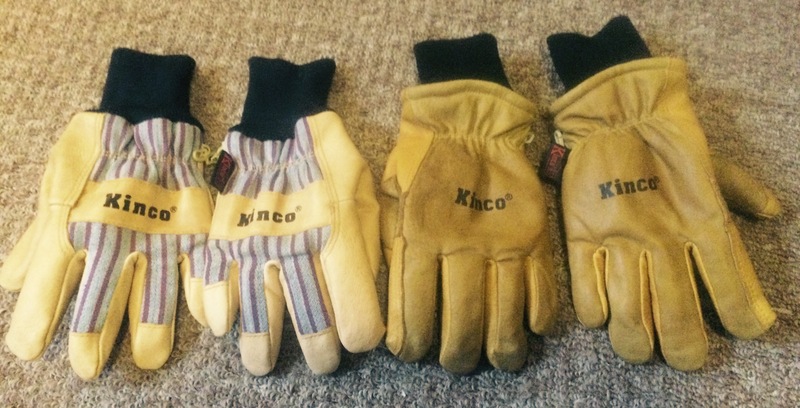 KINCOS are an amazingly affordable alternative to the high end gloves at your local specialty shop. Every few years I would wince at having to purchase another pair of high end technical climbing gloves to replace the beloved pair I had blown out after countless days of mountaineering, skiing, and ice climbing. Nothing destroys quality gloves faster than rappelling, and I wasn’t sure if there was a solution. Then I discovered Kincos. After seeing these are priced between $18-$25 on Amazon, and available at your local Lucy Hardwear store, I decided to try both popular models. What could I lose at that price? First off the “Lined Grain Pigskin Leather Palm with Knit Wrist”, which is pictured on the left, have a patented “HeatKeep” lining that was warm enough to keep my partner Bob’s hands toasty for a recent 8-hour day on Mount Washington climbing Pinnacle Gully. Bob wore these gloves exclusively from the time we left the parking lot to picking our way across the Alpine Gardens with -20 wind chills. His hands were toasty through-out. I like very dexterous gloves when leading ice, so I opted to wear my new Outdoor Research Alibi 2 Gloves (review forthcoming) for the technical climb, but once we topped out I donned the Kinco Ski Gloves. These kept my hands incredibly warm as we crossed the Alpine Gardens and descended down the Lion’s Head Route. Yesterday I took them skiing at Bretton Woods and confirmed they are the bees knees. Yes, those are new skis, and yes, those will be reviewed soon too. While the Ski Gloves are pre-treated with “REVIVEX waterproofing solution” I opted to bust out the Nixwak Waterproof Wax that I use on my boots & hiking shoes. Rubbing this stuff into the leather with bare hands adds an extra layer of protection, protects the leather, and brings back fond child-hood memories of trying to break in a stiff baseball glove. If you really want to waterproof the model with fabric on the back you could also use this. Disadvantages: Not a “Precision Fit” but just fine for mountaineering, skiing, and seconding hard technical climbs, needs some maintenance to treat & break in. In summary, KINCOS are an amazingly affordable alternative to high end climbing/skiing gloves. They are not however an absolute replacement. High end gloves definitely have their place, as an upcoming review for the Outdoor Research Alibi II Gloves will allude too, say stay tuned for that and thanks for reading! You can find the lowest price on Kinco Ski Gloves on Amazon here!